You may not have heard of Heron Oblivion yet, but that’ll soon change.The psych-rock band recently signed to the venerable Sub Pop label, despite only having publicly played live just a few times prior, and have now toured with stoner-rock troubadour Kurt Vile. Part of that has to do with the band’s pedigree — guitarists Ethan Miller and Noel Von Harmonson played in brain-fryers Comets on Fire, with Von Harmonson also playing in Sic Alps and Six Organs of Admittance and Miller in Howlin’ Rain and Feral Ohms; Charlie Saufley played in the similarly minded Assemble Head in Sunburst Sound; and singer/drummer Meg Baird has played in psych-folk band Espers as well as solo. The rest has solely to do with the sheer power of their debut, self-titled album. Over seven songs, the bands’ axes clash like fighting wolves, tangling like the brambles and branches that adorn the album cover. Keeping all this Crazy Horse-style madness reined in is a grounded rhythm section and the heart-stopping vocals of Baird. Her voice can simmer low and quavering like a classic British folk singer and then rise to seemingly unattainable heights on songs like the climactic "Your Hollows." The Odd Future trio MellowHigh (formerly a duo known as MellowHype) are generating much salivation for their first, self-titled album. One listen to the old-school-flavored “Extinguisher” and it’s not hard to hear why. “Hip-hop is back” one of them says near the end of the song. No doubt. The album’s due on Halloween via Odd Future. Nor. Cal.’s Tera Melos are one of the coolest guitar bands around, wrangling their guitar necks around each other with much interlocking riff mayhem. 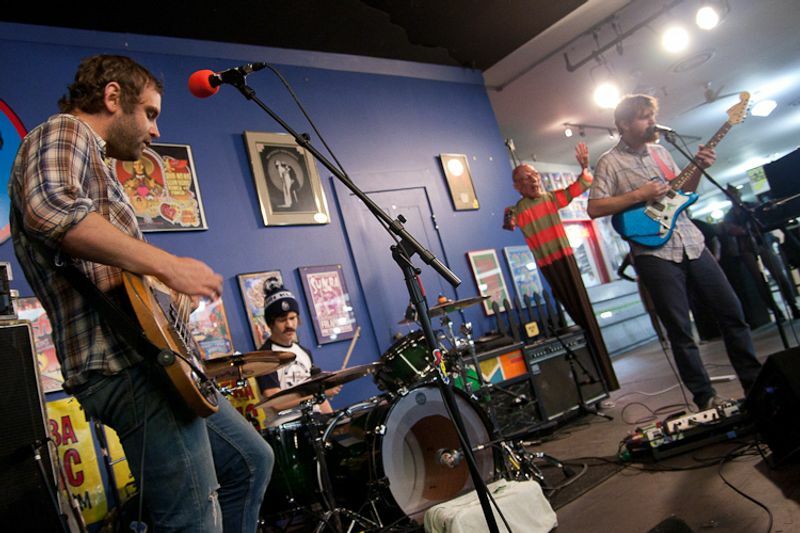 See how they do it with a video of their performance at Amoeba SF below. Read my interview with the band here, and check out their album X’ed Out. Sic Alps have long been an S.F. favorite, fusing the hippie aesthetic of the San Francisco of lore (Grateful Dead, Jefferson Airplane) with the newer noise-garage ethos similarly employed by acts like Ty Segall, who played in Sic Alps for a time, and Thee Oh Sees, with whom they’ll play at the the El Rey Theatre Sept. 9. The band boasts a prolific career in a short time — the band formed in 2004 and has released over a dozen EPs, three regular albums and another, A Long Way to a Shortcut, compiling their singles. Now, they’ve chosen to give their fourth album a self-titled name (out Sept. 18; preorder here), and with that comes a somewhat cleaner sound, complete with strings, courtesy of Ryan Francesconi, who arranged strings for Joanna Newsom. I spoke with frontman Mike Donovan about the new album and the band’s trajectory. PST: One of the most noticeable new sounds on the record is the strings on songs like “Glyphs” and “Rock Races.” Can you talk about how that came about and working with Ryan Francesconi?